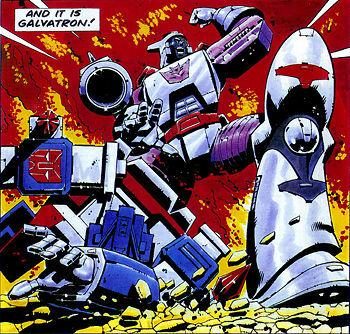 Oh, I'd kill for a new Knock Out, he's still my favorite Prime character. But only if he has his proper paint job, of course. Motto: "Rule number two: Double Tap." 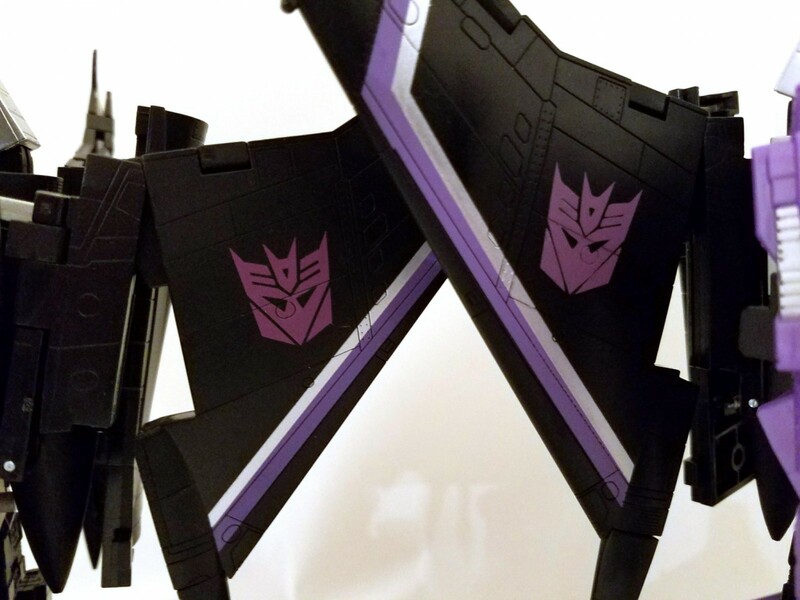 Um, has anyone else noticed that the Decepticon sigil on Starscream is NOT the G1 version? I SWEAR that is the Bayverse con symbol. No thing that is created by humans is infallable. AutobotTrainer wrote: Um, has anyone else noticed that the Decepticon sigil on Starscream is NOT the G1 version? I SWEAR that is the Bayverse con symbol. They're gonna get the symbols mixed up here and there until the end of time, aren't they? After many customs and an expensive repaint from the Transformers Club, Hasbro is finally providing fans with a G1 styled Barricade in their G1 styled line, Siege. 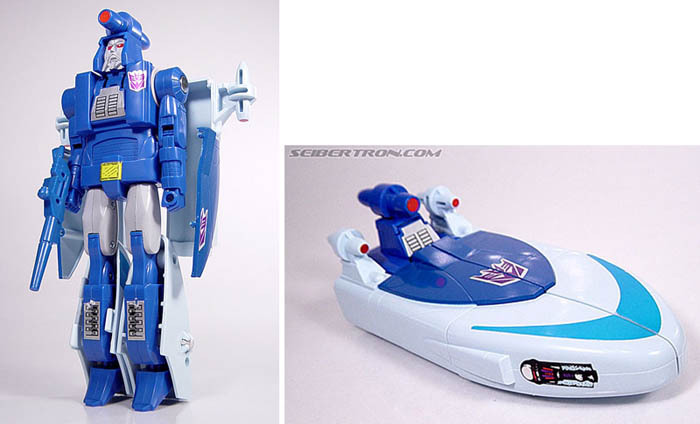 While some fans were puzzled with it's initial appearance being such a departure from the movie design (especially the face) other fans were very quick to see the similarities between this toy and the fan art done by now famed Transformers artist Guido Guidi, which depicted what what Barricade would have looked like in the G1 era. And now we know, thanks to a quote from Guidi himself that his design is exactly what Hasbro was going for. He speaks of his involvement in both modes and we thank fellow Seibertronian matthewrex for letting us know. Guido Guidi wrote: Always cool when a character art get translated in plastic! Here's the newly revealed Hasbro's "G1" Siege Barricade, and the fan art I did that inspired it! And yes Hasbro involved me on that (specifically on early alt mode concept art). Now it's official! 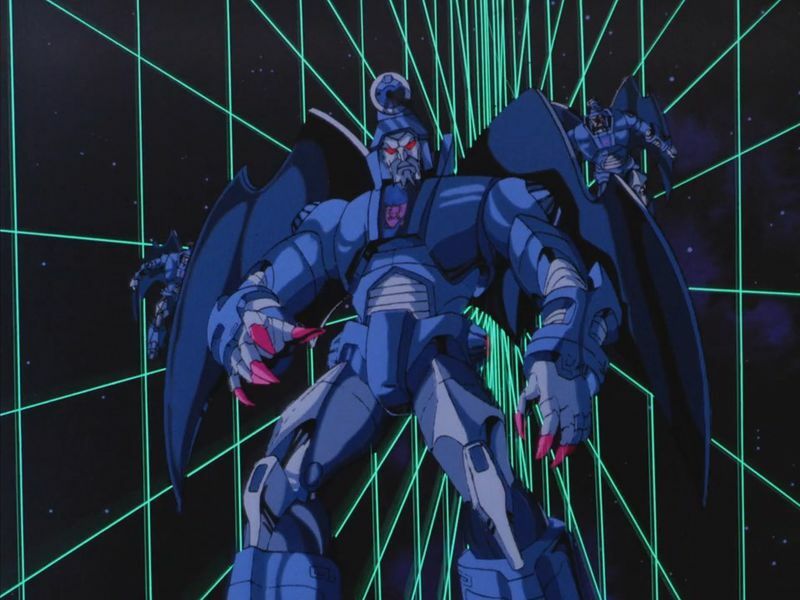 And for those curious as to how exactly the paradigm of this design works, it isn't necessarily movie Barricade in a "Generations" form but instead this is what an initial design would have been for a character who ended up looking as he does in the film. The images below should help illustrate that. So, anyone else happy they can now have a G1 style Barricade to add to your collection that isn't exclusive/expensive? It was the first thing I noticed about him when he was revealed. It definitely is the Bayverse insignia. Still, I like the new mold. It looks great in robot mode, and good in tetrajet mode if you forgive the legs. Plus, the Bayverse insignia means he can double as your Bumblebee movie Seekers! No, the most eye catching difference is the shape of the "eyes". On G1, they are triangular in shape, whereas in the Bayverse insignia, they have four sides. Both of those have triangle eyes. 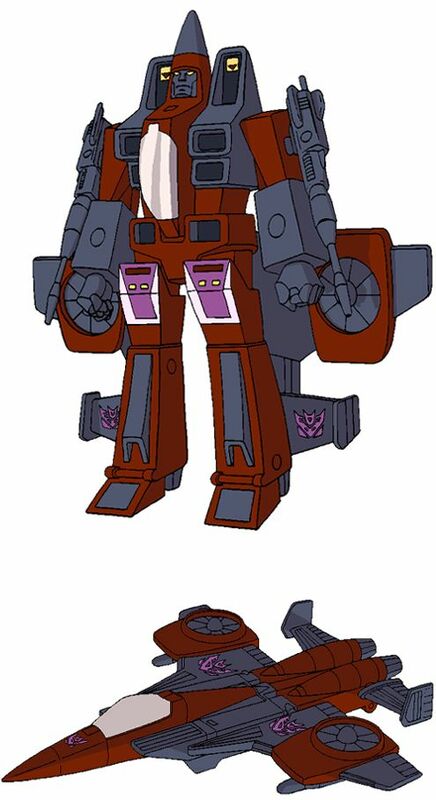 Sabrblade's example was a lot clearer thank you though which Skywarp is that toy? william-james88 wrote: So, anyone else happy they can now have a G1 style Barricade to add to your collection that isn't exclusive/expensive? Well you can keep calling it "G1 style Barricade" and I can keep calling it a lazy crap repaint to make more money out of an existing mold rather than provide a more unique and logical figure. I just can't see why people think this is a quality release worthy of spending actual money on. 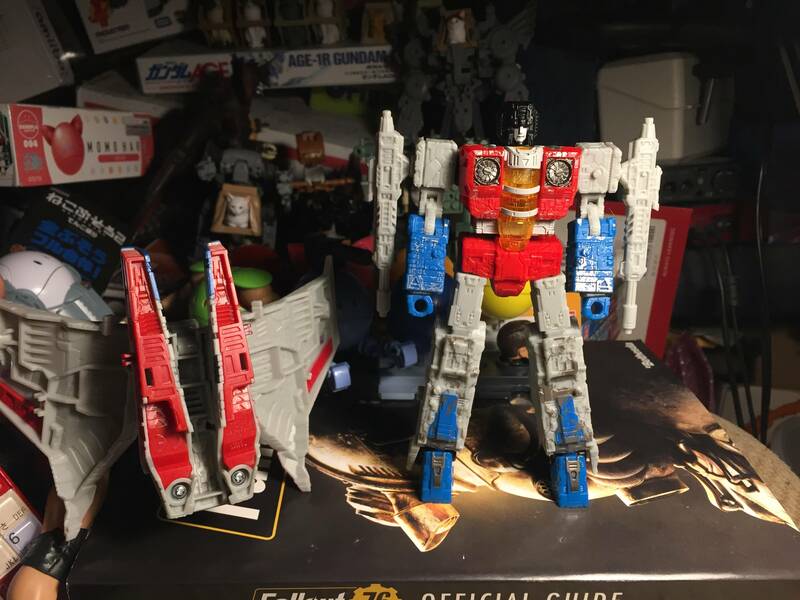 It's the very definition of Hasbro being frickin' lazy and saving money on a new mold by just reusing another with very little effort put into it. And so was Guido Guidi's (yay i got his name right this time) design. The guy's clearly done great work in the past but this whole thing is unimaginative garbage. Damn thing looks too dorky to be a Barricade. Fine for Prowl who's supposed to appear to be the boring good cop but a Barricade is meant to be the bad cop and one who'd rough you up plenty and this figure is far too bland and boring to give even a hint of that. Really is an absolute total missed opportunity. 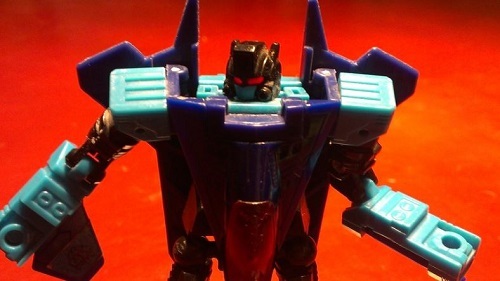 ZeroWolf wrote: Sabrblade's example was a lot clearer thank you though which Skywarp is that toy? Can we all stop fighting about Barricade and just agree to disagree. It’s been 3 days and this is getting **** old. No one is forcing you to buy it, like it, eat it, etc. go send some complaints to Hasbro. There’s way more to talk about in this line than one figure and anyone who is trying to is getting talked over. Enough. Meanwhile, Is there supposed to be a connection between Windblade and Thrust? The designs seem too visually similar for coincidence? 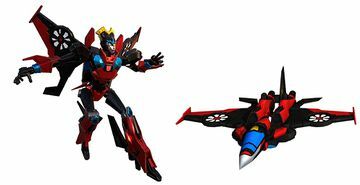 Maybe a new Cybertronian based Windblade as a Tetrajet could add to that. Create some [interesting] backstory for her this time, both within SIEGE and the new Comic continuity too. Renegade Seeker? Thrust's Twin IE a way of re-introducing the idea of branched sparks?? Really? I don't recall the 1984 toy able to remove all of its altmode kibble and make a completely separate vehicle from the robot. Especially one formed from kibble that's able to be removed all in one whole piece without needing to reassemble anything. 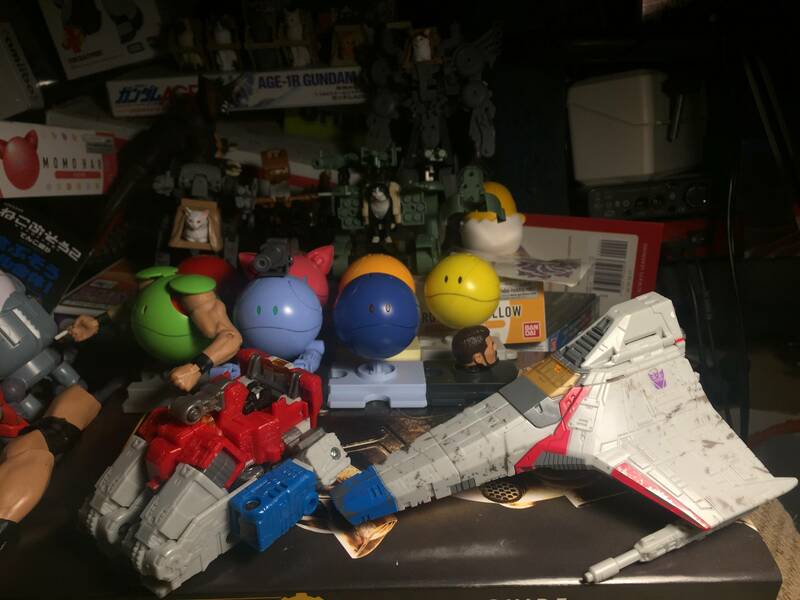 Name three other Starscream toys whose altmodes can be detached completely separate from their robot modes without losing the core integrity of the robot mode, and in one piece without having to reassemble anything. Last edited by Sabrblade on Tue Mar 05, 2019 11:01 am, edited 2 times in total. Illustrator of Marvel Comics Transformers, known for a visual design of "people in robot suits"..
AllNewSuperRobot wrote: Illustrator of Marvel Comics Transformers, known for a visual design of "people in robot suits".. This is a robot guy in a jet suit, not a human in a robot suit. Fleshy-faced artwork has nothing to do with excessive altmode kibble. It's what makes Scourge still the superior Flier design to this day. Even his original toy didn't suffer from it. I wonder if they would even need to change his design to add him to WFC and/or SIEGE? A lot of people want this. I’m sorry you don’t. Next time we’ll ask hasbro to reach out to you and ask you what you want. SIEGE Barricade is the result of a thought experiment. "What if Barricade had been in the original 1984/85 Transformers toy line-up?" What would his design have been? What mold would have been used? This is the answer. He's based heavily on an existing Diaclone mold. In this case, the one that became Prowl and Bluestreak and was eventually retooled into Smokescreen. That's what Guido Guidi was up to years ago with his fan art rendition, and it's the same conclusion Hasbro came to as well. Imagine if in 1985, Hasbro added a few more Decepticons based on Diaclone molds. Barricade could have been the result of taking the Smokescreen retool, repainting it, and adding a light bar to make him a police car again. The difference with the SIEGE version is that there isn't going to be any retooling to the alt mode between Prowl/Bluestreak and Smokescreen/Barricade. Only the head sculpts and weapon load outs are different. The light bars are modular pieces that can be included or excluded, just like the shoulder cannons or other weapons. If you don't "get it," that's fine. But other people do, and that doesn't make their opinion less valid than yours. Liking something is subjective. I can appreciate that you don't like the mold in general, though, in which case yes, it would be disappointing that the same mold you don't like as Prowl is also now Barricade. That should make it easier to retool him into a proper Earth-mode jet. 4,181 pages were recently viewed by 678 unique visitors. This page was viewed 1 times on Friday, April 19th 2019 2:04am CDT. © 2019 Seibertron, Inc. DBA Seibertron.com. All Rights Reserved. Established June 2000. Seibertron.com is owned by Ryan Yzquierdo.